Friendship! If you are a current member, you could extend your membership for another full year for free! Get a friend to sign up for a regular one-year membership, and we will give you an extra year. Just email Josh with the full name of the person you've referred. Once their membership is processed, we will give you a full year’s subscription for free! Libraries! We announced our library promotion in the last SP Newsletter. In case you missed it, here’s how it works: if your local or university library subscribes at your request, we will sign you up, too. That's right, if your library signs up we will send you a free year-long membership. Send an email to Josh with the name of your library and when its membership is processed he will put your first issue in the mail. These promos will end September 30th, so don’t delay, and spread the word! 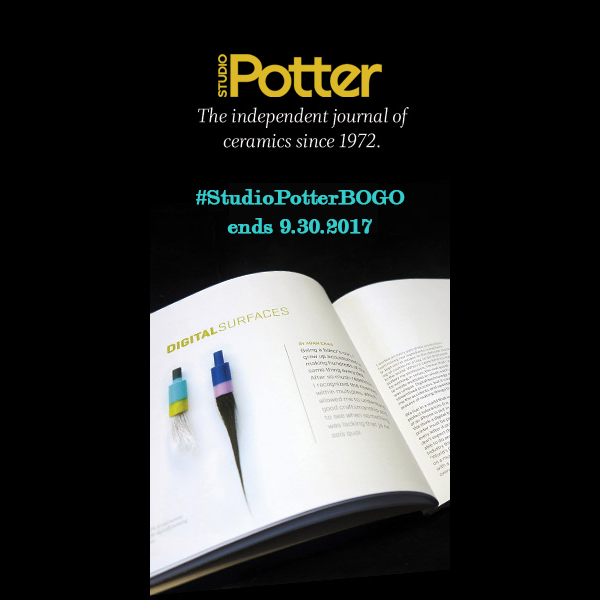 Follow us on Instagram @thestudiopotter and repost our #StudioPotterBOGO posts.